If you have followed my previous posts about baby food, you know that we were trying to do “Baby Led Weaning” with our daughter, instead of the traditional pureed baby mush. In theory, it seemed like a great idea, and made perfect sense to me. I just adjusted my cooking a little bit and eliminated salt and sugar from our diet, and offered Olivia whatever we were eating. The idea was that she could eat as much or as little as she wanted, and then get the rest of her nutrition from breast milk (so I continued to feed her on demand). Apparently some babies dive right in and love it, but a few babies really hang on to breastfeeding for a long, long time, and it seems that Olivia is one of those babies. She simply was never very interested in food. I tried everything I could think of, and some days were better than others. Somtimes she would eat a lot of somthing and I would think that I’d figured it out, but then we would end up right back where we were before, with her only eating a few bites here and there, and some days not eating anything at all. At eleven and a half months she was still getting about 90% of her nutrition from breast milk. Make no mistake, I am a huge fan of breastfeeding, and I’m not in any rush to wean her. She seems healthy enough, and her growth has continued to be off the charts. Nutrition is the last thing I’m worried about. But at the same time, I am getting tired of feeding her every two hours, and of being tied down. I’d like to be able to leave her with relatives for more than two hours. And I want her to try all of those exciting foods out there! We have tried purees several times in the past, but Olivia hated them. She only wanted to grab the spoon from me, and if I tried to put anything in her mouth she would arch her back and scream. A lot of people told me I had to “teach” her how to eat by holding her down and forcing the spoon into her mouth. I’m sorry, but that just felt wrong to me, and the times I tried it, it didn’t work anyways; it only made her madder. I was starting to accept my fate that maybe Olivia wasn’t going to start eating until she was 18. But then, little by little, I started finding things she would eat reliably. One was Cheerios, and the other were those pouches of pureed fruits meant for toddlers. She loved them so much that she would devour a whole one in one sitting if I let her! This is what finally led to our breakthrough… One day at the supermarket near my brother-in-law’s house, I ran across a bin of small plastic cups with chunky straws in them, meant for older kids. 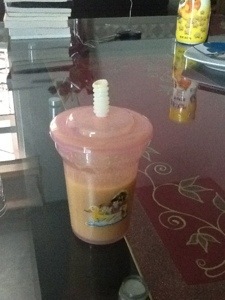 Since Olivia loves straws, I decided to get one and put purees inside it, like a milkshake. Believe it or not, it worked perfectly! I let her watch me mix the puree and fill it into the cup, and then I took a sip from it acting as if it were the BEST thing in the world. 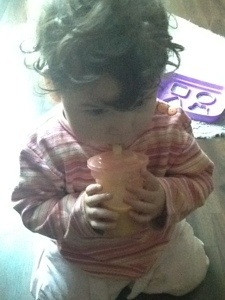 She instantly wanted it, and she ate an entire cup-full of baby food in just five minutes! She’s so little to get the hang of the straw like that! I don’t think my kid’s figured it out until they were 18 months! Go Olivia for being an advanced straw drinker!! I loved making baby food when mine were little! I came up with some pretty crazy concoctions!